Other Manual Sod Cutters & Lawn Edger's do NOT Even Come Close! 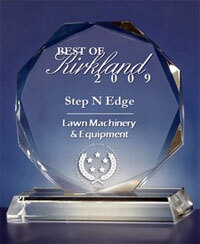 #1 Sod Cutter Lawn Edger™ is by far the best 100% all Stainless Steel bladed manual lawn edger in the World! With all stainless steel brackets and bolts. The steel blade and footplate is also weather and rust resistant. Proudly made in the USA since 1984. Photo Above is this year's new and improved 2005 extra sturdy, all Stainless Steel bladed Lawn Edger with 4 spot welds and 4 pop rivets in footplate. FREE S&H IN THE "LOWER 48"! Superior to the lawn roller edger and lawn half moon edger the only two major lawn edger's available. It is a "must have" whether you're planning to redesign your lawn or cut angles, straight edges or sod for your beautiful new yard. 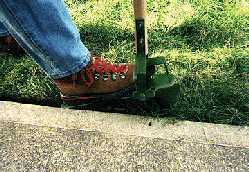 The #1 Lawn Edger™ does not require bending or straining to use, just an even heel-to-toe walking motion. About the same size as a garden rake or hoe, and made out of durable steel with a wooden handle for strength and durability; and this manual Lawn Edger is easy to clean and simple to maintain. and we guarantee it for a full 3 years! The half moon and Roller edger can't compare to #1 Lawn Edger™ ease of use and non-back strain walk and cut technique. 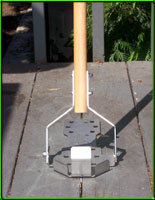 These other lawn edgers do not offer this convenience because of inferior design. There is no reason why you should have to wear protective goggles to shield yourself from rocks and other flying debris associated with electric and gas powered edgers. It also serves as a wood deck groove and crevice cleaner. Yes! Now you have the perfect tool for swiftly removing leaves, sticks, mold, dirt and all sorts of debris from the spaces between the planks of your wood deck. The long 38" handle lets you use the cleaner without bending or stooping. So buy a #1 Sod Cutter Lawn Edger™ today and let worries be a thing of the past. 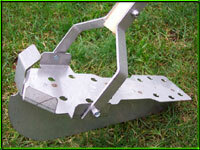 As you can see other edgers on the market can't match #1 Lawn Edger™ convenience, ease of use, quickness and price. Accept no substitutes or cheap imitations. So what's stopping you from getting the best easy-to-use lawn edger ever?